Aim: The association of single or multiple level cervical spondylotic disease with atlantoaxial instability is assessed. The implications of identifying and treating atlantoaxial instability in such an association are highlighted. Materials and Methods: The analysis is based on an experience with 11 patients treated during the period June 2013-June 2014. All patients had single or multilevel cervical spondylotic disease. The spinal canal compromise and evidence of cord compression was evident on imaging in the cervical subaxial spine and was related to disc bulges and osteophytic bars. There was no or relatively insignificant compression of the cervicomedullary cord by the odontoid process. There was no evidence of odontoid process-related instability on dynamic imaging. 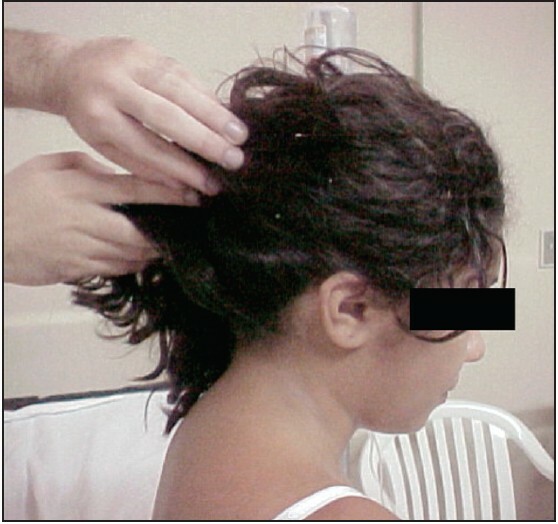 Apart from presence of features of cervical spondylosis, investigations and surgical exploration and direct manual handling of the facets revealed evidence of Type B (posterior) atlantoaxial'facetal' instability in all patients. Our 5-point clinical grading system and Japanese Orthopaedic Association (JOA) scores were used to monitor the patients both before and after surgery and at follow-up. Surgery involved both at lantoaxial and subaxial cervical fixation. During the average period of follow-up of 9 months (5-17 months), all patients showed remarkable and gratifying neurological recovery. Conclusion: We conclude that atlantoaxial facetal instability can be 'frequently' associated with cervical spondylosis and needs surgical stabilization. Our surgical outcome analysis suggests that missing or ignoring the presence of atlantoaxial facetal instability can be an important cause of suboptimal result or failure of surgery for cervical spondylotic myelopathy. Purpose: Metastatic spine disease is an ever-increasing burden on health care systems. Certain levels in the spine confer unique biomechanical characteristics and hence are of interest. Isolated C2 lesions are rare. We aimed to review our results in surgical management of C2 lesions. Materials and Methods: We reviewed all surgical stabilizations of metastatic spine lesions over the preceding 4 years. Six patients with C2 lesions were identified. Of these five underwent surgical stabilization primarily for disease affecting the second cervical vertebra. Case notes and radiology were reviewed to determine presentation, outcomes and complications. 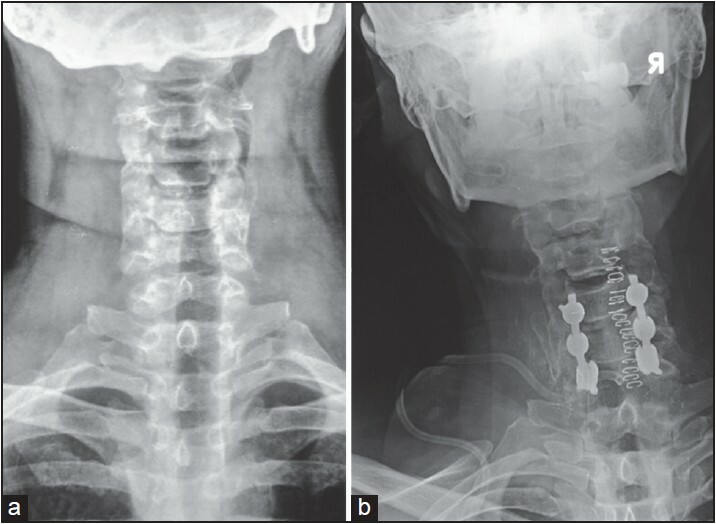 Results: Cases were treated primarily by posterior instrumentation from either occiput or C1 to the subaxial cervical spine. The median survivorship after surgery was 283 days. There were no cases of infection, VTE or implant failure. There were no cases of neurologic deterioration with all maintaining Frankel E grading. Conclusion: Metastatic lesions affecting the second cervical vertebra are rare. 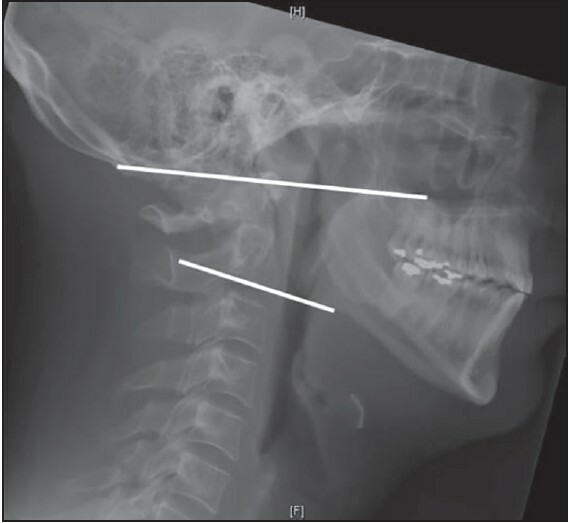 A variety of stabilization options tailored to the individual lesions, including occipitocervical fixation, in this small series was successful in maintaining stability and resolution of symptoms. Objective: Rheumatoid arthritis (RA) is an inflammatory disease that affects the craniovertebral junction (CVJ). Patients may suffer from atlantoaxial instability (AAI) and basilar invagination (BI) with variable presentations ranging from pain to quadriparesis. Managing these patients is often challenging due to their chronic use of steroids, methotrexate, and biologics; which impedes bone and wound healing. We report our experience with the surgical management of these patients undergoing fusions at the CVJ. Materials and Methods: We conducted a retrospective study identifying all patients with the diagnosis of RA who underwent spinal fusions at our institution over the past 11 years. A total of 205 patients were identified amongst which 18 patients (8.8%) who underwent 20 fusions involving the CVJ. Demographic, clinical, and radiographic data were analyzed. Results: Five patients had AAI and 13 patients had BI. Two patients with C1-2 fusions underwent reoperation: One for pseudoarthrosis and one for BI. The average preoperative Nurick was 1.4 and improved to 0.5 postoperatively (P < 0.001). After conducting analyses stratified by dichotomous preoperative variables, the presence of steroids, methotrexate, biologics, and prednisone dosage less than 7.5 mg did not affect outcomes. Prednisone dosages ≥7.5 mg had significantly smaller improvements in Nurick score compared to patients not on steroids or on prednisone dosages <7.5 mg (0.40 vs 1.36, P = 0.042). Similarly, patients on biologics had significantly smaller improvements in Nurick score compared to patients not on biologics (0.27 vs 1.16, P = 0.038). Conclusion: Fusions at the CVJ in patients with RA on daily prednisone dosages of less than 7.5 mg and/or methotrexate can be performed safely with good outcomes, fusion rates, and acceptable complication profiles. Daily prednisone dosages of more than 7.5 mg or biologics may impact clinical outcomes. Purpose: Facet joints are important anatomical structures for the stability of spine. Surgical or degenerative damage to a facet joint may lead to spinal instability and causes clinical problems. This article explains the importance of facet joints, reviews facet replacement systems, and describes a simple and effective method for facet replacement after surgical removal of facet joints. Materials and Methods: Ten patients were operated with the diagnosis of unilateral nerve root compression secondary to facet degeneration. The hypertrophic facet joints were removed with microsurgical techniques and the roots were decompressed. Then, a unilateral artificial facet joint was created using two hinged screws and a dynamic rod. Results: The clinical outcome of all the patients was determined good or excellent at second and last follow-up (mean 13.3 months) controls using visual analog scale (VAS) and Oswestry Disability Index (ODI) scores. Radiological evaluations also demonstrated no implant-related complications. 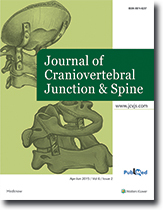 Conclusions: The authors suggest that, if removal of a facet joint is necessary to decompress the nerve roots, the joint can be replaced by a construct composed of two hinged screws connected by a dynamic rod. This simple system mimics the function of a normal facet joint and is an effective technique for unilateral facet joint replacement. Context: Somato-sensitive innervation of bowels are maintained by lower segments of spinal cord and the blood supply of the lower spinal cord is heavily dependent on Adamkiewicz artery. Although bowel problems are sometimes seen in subarachnoid hemorrhage neither Adamkiewicz artery spasm nor spinal cord ischemia has not been elucidated as a cause of bowel dilatation so far. Aims: The goal of this study was to study the effects Adamkiewicz artery (AKA) vasospasm in lumbar subarachnoid hemorrhage (SAH) on bowel dilatation severity. Settings and Design: An experimental rabbit study. Materials and Methods: The study was conducted on 25 rabbits, which were randomly divided into three groups: Spinal SAH (N = 13), serum saline (SS) (SS; N = 7) and control (N = 5) groups. Experimental spinal SAH was performed. 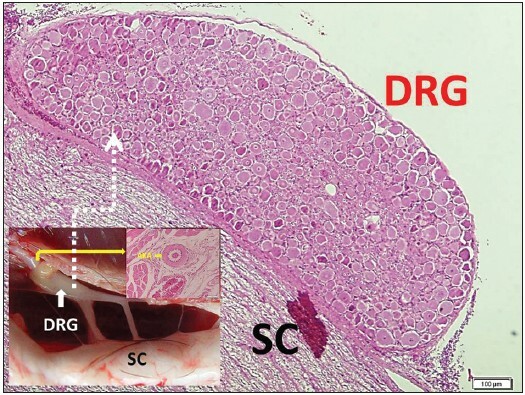 After 21 days, volume values of descending parts of large bowels and degenerated neuron density of L5DRG were analyzed. Statistical Analysis Used: Statistical analysis was performed using the PASW Statistics 18.0 for Windows (SPSS Inc., Chicago, Illinois). Two-tailed t-test and Mann-Whitney U-tests were used. The statistical significance was set at P < 0.05. Results: The mean volume of imaginary descending colons was estimated as 93 ± 12 cm 3 in the control group and 121 ± 26 cm 3 in the SS group and 176 ± 49 cm 3 in SAH group. Volume augmentations of the descending colons and degenerated neuron density L5DRG were significantly different between the SAH and other two groups (P < 0.05). Conclusion: An inverse relationship between the living neuronal density of the L5DRG and the volume of imaginary descending colon values was occurred. Our findings will aid in the planning of future experimental studies and determining the clinical relevance on such studies. We report a rare case of trigeminal neuralgia. A 23-year-old woman with a history of 1 year of typical trigeminal neuralgia manifested the characteristics of basilar impression. Magnetic resonance imaging (MRI) demonstrated basilar impression, deformity of the posterior fossa with asymmetry of petrous bone, and compression of medulla oblongata in the topography of the odontoid apophysis. The operation was performed through a suboccipital craniectomy. The neuralgia disappeared after surgery and remains completely resolved until today. 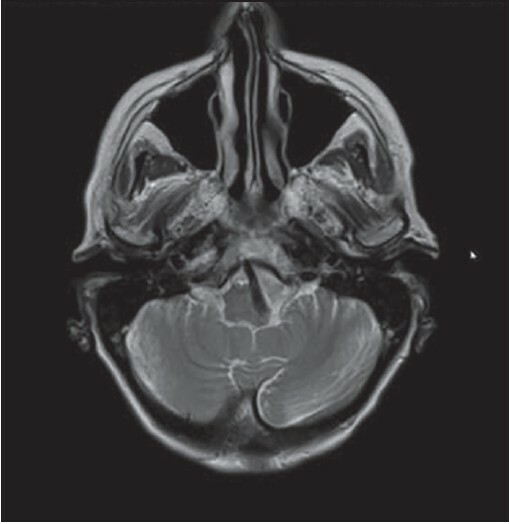 This is the second reported case of trigeminal neuralgia in a patient with basilar impression in Brazil. 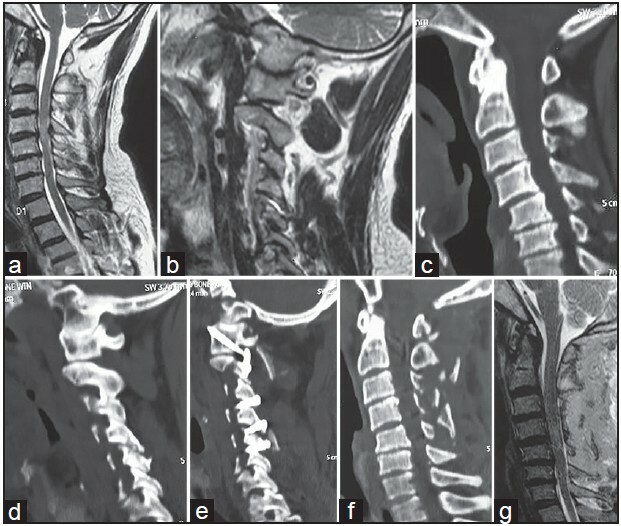 The authors report a rare case of spontaneous dystrophic thoracic spine dislocation in a 14-year-old boy with neurofibromatosis type 1 (NF-1). 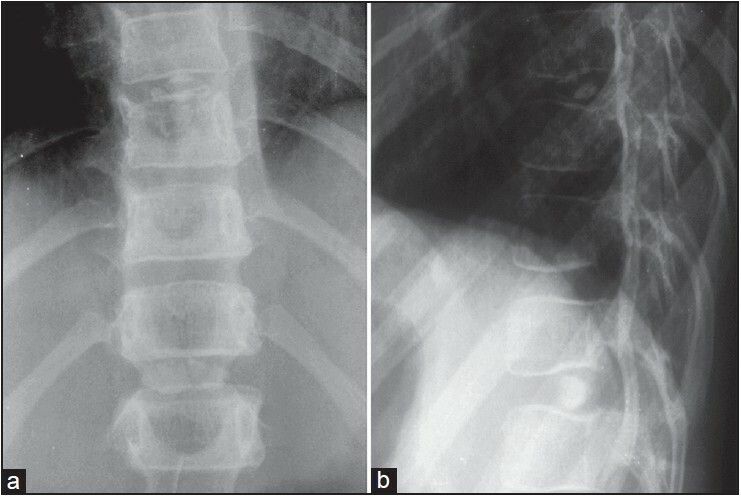 Anteroposterior and lateral standing radiographs showed a dysplastic kyphoscoliotic deformity, with the thoracic kyphosis and scoliosis measuring 75° and 69°, respectively. 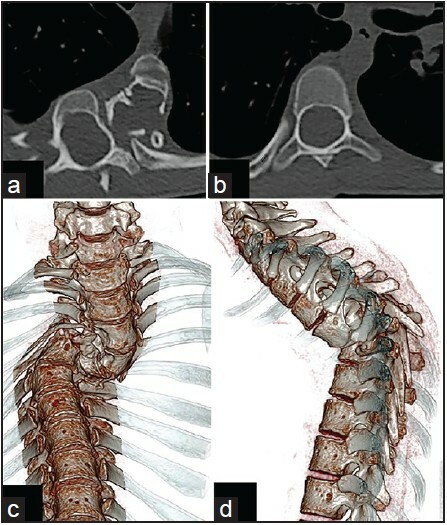 Three-dimensional reconstruction after computed tomography demonstrated spondyloptosis at T5-T6 with overlapping of T5 over T6 and T7. The patient underwent circumferential fusion with anterior fibular strut grafting mechanically secured between the inferior and superior endplates of T5 and T7 followed by an instrumented posterior fusion from T2 to L1 and thoracoplasty. There was satisfactory resolution of the deformity with stabilization at the last follow-up evaluation. Schwannoma with acute hemorrhage is rarely seen. 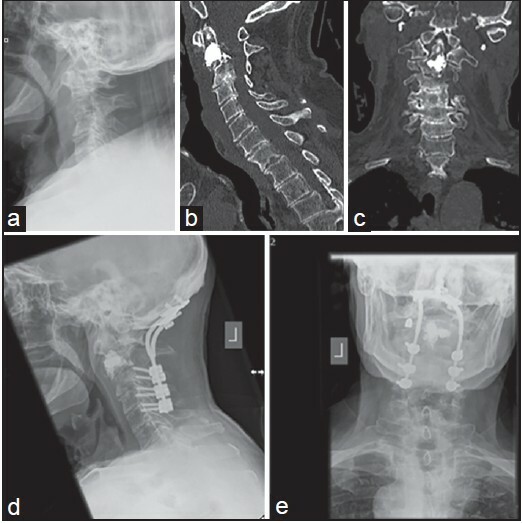 A 44-years-old male patient presented with complaint of neck pain and acute onset of quadriparesis. 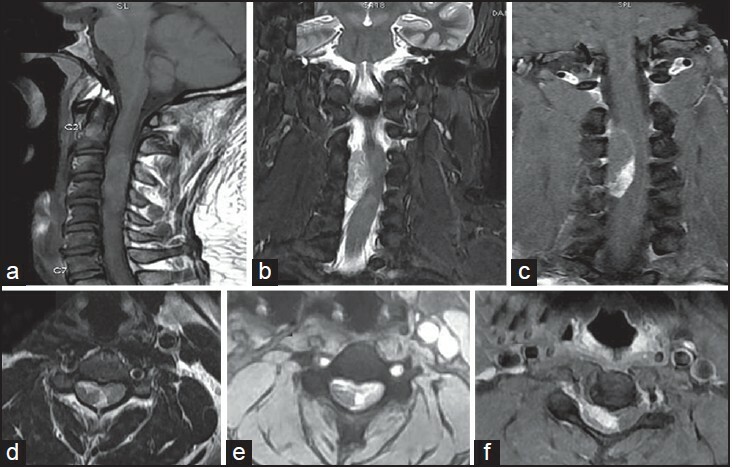 Magnetic resonance imaging (MRI) of his cervical spine revealed evidence of an intradural extramedullary tumor with intratumoral acute hemorrhage. He was operated in emergency and the mass was found to be schwannoma with acute hemorrhage. Post operatively the patient improved significantly. Though schwannomas show microscopic intratumoral hemorrhage and necrosis at times, schwannoma with acute hemorrhage resulting acute onset of neurological deficit is very uncommon. Pure ligamentous flexion-distraction injuries of the lumbar spine are relatively rare and even less commonly associated with neurologic compromise. They are largely related to the use of lap belt restrains during motor vehicle accidents. We report a 19-year-old female backseat passenger wearing a lap belt who was involved in a head-on collision. On admission she was paraplegic, with a T12 sensory level and no motor and sensory function of S4-S5 (American Spinal Injury Association (ASIA) A). 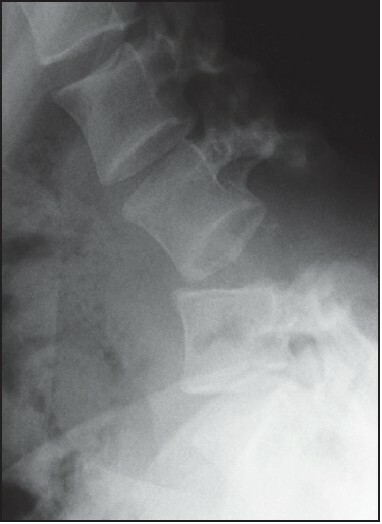 Plain X-ray and computerized axial tomography (CAT) spine showed a flexion-distraction injury at the L3-L4 level. During surgery in the interspinous space a conus medullaris was identified, which was completely severed from the spinal cord. The patient underwent a fusion procedure and made a good recovery. Twelve months after surgery she was able to walk with a knee-ankle-foot orthosis, she has no motor function below knees, no sensation below L2, and no voluntary bladder control. Although described type of injury is very rare, one should always have in mind devastating consequences of inadequate or improperly worn seatbelts. Vertebral artery compressing the medulla and causing intractable vomiting has only been reported once previously. We report a case of a 69-year-old woman with intractable nausea and vomiting causing a 50 pound weight loss and who failed medical management and whose symptoms were completely reversed following microvascular decompression (MVD). Cervical myelopathy (CM) is mostly a degenerative process ending in myelopathic and/or radiculopathic syndromes. On T2-weighted magnetic resonance imaging (MRI), CM appears as a hyperintense area near the spondylotic spine. This high intensity signal depends on the impact of outer forces and their duration. It also determines the prognosis of the surgical candidate. A 40-year-old male patient admitted to our clinic with right upper extremity weakness and hypoesthesia that had started 2 months earlier. On neurological examination there was 2/5 motor weakness of right biceps brachii, and hypoesthesia over right C6 dermatome. Right upper extremity deep tendon reflexes were hypoactive, but lower ones were hyperactive. After clinical and radiological work-up, preliminary diagnosis was directed to a spinal intramedullary tumor. Total resection of the herniated cervical disc fragment and the mass lesion was managed. Pathology of the mass lesion was compatible with subacute infarct tissue and inflammatory response. Final diagnosis was CM under effect of cervical disc herniation. 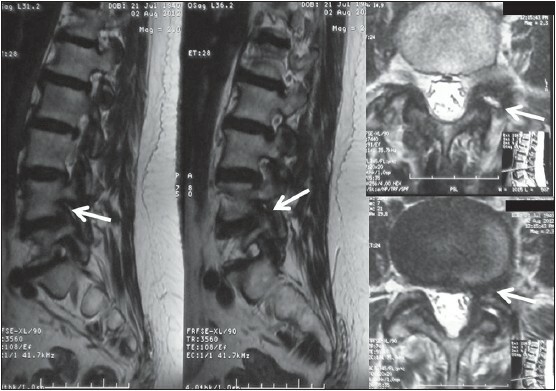 Contrast-enhanced spinal cord myelopathic lesions are very rare and resemble much more tumors and inflammatory processes. However, the principal treatment approach totally differs depending on pathology. When there are both a disc herniation and a high clinical suspicion; biopsy should be delayed. The most probable solution will be surgery for the disc disease with thorough preoperative scanning of vascular malformations; clinical and radiological close follow-up after surgery. Biopsy or surgical resection can be performed if patient deteriorates despite the primary surgery.